Clarence played on the 1993 National Championship Football Team, Florida State University. He was a double Math Major at Florida State. 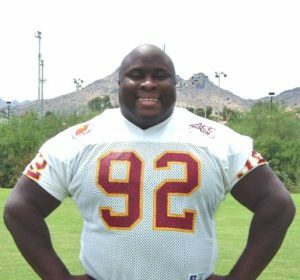 Clarence held the bench press record at Florida State, as well as holding the NFL camp bench press record. He stands 5’11”, and weighs 290 pounds. Clarence has bench pressed 640 pounds, squatted 800 pounds, and leg pressed 1 ton. Clarence travels around the U.S. and over-seas speaking to and inspiring young people to reach their potential in life. He is a native of Columbia, South Carolina. He attended Florida State University and majored in mathematics. He played football and was part of the 1993 National Championship team at Florida State, coached by Bobby Bowden. Clarence was the strongest man ever to play at Florida State, setting the bench press record at 530 lbs. His all-time best bench press was 650 lbs. After college, Clarence taught math at an Alternative High School, and worked at a drug rehabilitation center. He had the opportunity to try out for the NFL in Dallas, TX. There, Clarence set the NFL strength record on the bench press. He also played APFL football for the Kansas Koyotes. After working with the Power Team, and a nation wide inner-city organization, Clarence founded Solid Rock International. He continues with Solid Rock International as Motivational Speaker and Minister. Clarence’s experience traveling around this country and the world, reaching out to youth, motivating this generation is quite extensive. He is sought out by numerous organizations as a guest speaker. Clarence has been speaking in public and private schools, churches, detention centers, prisons, at city-wide events and community centers for over a decade. Currently, Clarence continues with his organization, Solid Rock International. Clarence, his wife Diane and three young children, Junior, Kyrene & Keyah live in Phoenix, Arizona. Clarence speaks at school assemblies, camps (keynote speaker), student leadership conferences, “True love waits” rallies (sexual abstinance until marriage). prisons, church services (Clarence is an ordained minister), and corporate events.